Sometimes a tendency to poor posture is inherited – look at your mother / grandmother. Poor posture can also be caused by lack of muscle tone due to insufficient exercise as we were growing. There can also be psychological causes – unhappy childhood (trying to make yourself invisible, small, not drawing attention to yourself) or as a response to breasts which become too big too quickly or are not dealt with adequately through a supportive bra as they grow. Whatever the reason, some of us are left with rounded shoulders, a tendency to thrust our head forward and possibly a humpy back to some degree. Nothing is more ageing than this posture. Have plenty of full length mirrors around your home in order to maintain an awareness of your posture. Develop and awareness of your breathing and link it in your mind with walking tall. The old trick of imagining a cord from the crown of your head pulling you up straight. Avoid tops which follow your contours too closely at the back – much more flattering to choose a straight drop or just slight shaping at the waist. Shoulder pads go in and out of fashion of course, and the mega shoulders of the 80’s happily only remain as a distant memory for those of us old enough to have worn them! 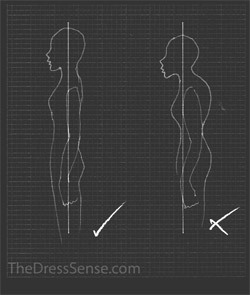 But slight padding on the shoulders can help to visually correct poor posture. (If you make your own clothes a good tip is to set the shoulder pad back about 1cm – 1.5cm from the intended position – this gives the impression that you are carrying your shoulders correctly). Avoid chokers – a pendant on a chain is more flattering. Tailored clothing helps to disguise poor posture, making us appear smarter – but of course tailored clothing is not appropriate for every climate – experiment with light padding in summer jackets and knitwear. When we feel we look smart we are more inclined to walk tall. 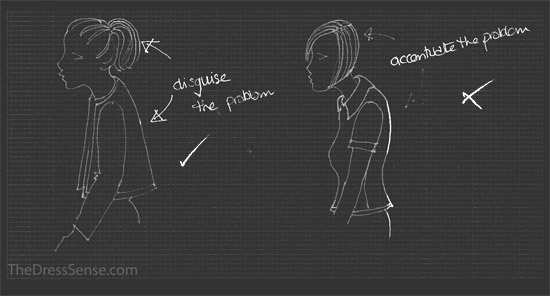 By manipulating the silhouette and profile of your head can also help to disguise poor posture. 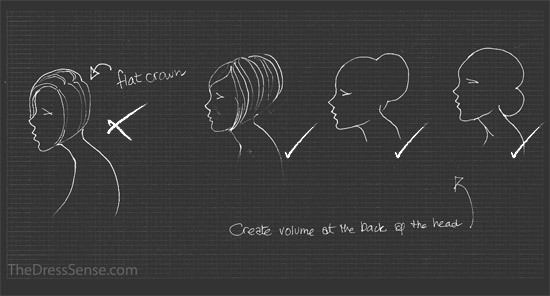 We cannot change our skull shape literally, but it is possible to change the appearance by being creative with our hair. Try to create volume at your crown and at the back of your head – through back brushing or experimenting with the numerous gadgets available to create buns, chignons and French Pleats. Even a simple healthy swinging ponytail helps! You can liberate your look! Posted in hairstyle, jackets, necklines, posture.